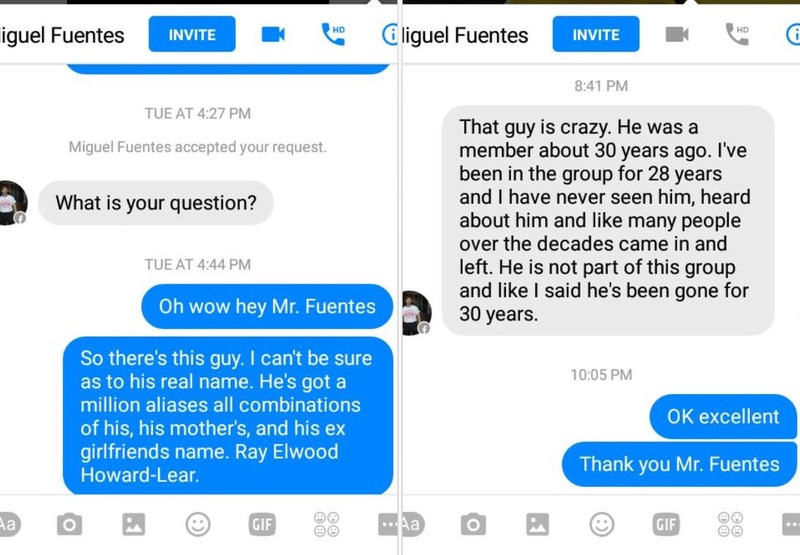 James Ackerson from the Lord RayEL Exposed team made contact with 28 year Veteran and Commander of the Chicago Guardian Angels Mr Miguel Fuentes and questioned the legitimacy of whether or not Raymond Howard Elwood Lear was Commander of this Chapter. Mr Fuentes of The Guardian Angels, Chicago. This is a claim documented both on the website of Lord RayEL / Ra-el and within the public file section of the online Facebook International Congregation of Lord RayEL. Veteran of 28 years Mr Fuentes pictured above has clearly stated that Raymond Lear was not Commander of Chicago Guardian Angels as the Ecumenical Order of Christ claim. IN CONCLUSION, The images that have been posted by The Ecumenical Order of Christ in support of their claim, are out of focus and the original sources are missing. To prove legitimacy, these should be provided to back up their claim, without them, they are not worth the paper they are printed on. Perhaps the Holy Apostolic Order of Christ and the Ecumenical Order of Christ can provide these so they can be verified by an independent source! Many thanks to James Ackerson and Miguel Fuentes. Alan Douglas is not his handler. Alan Douglas is Angelus Domini AKA Raymond Lear. A group of people using a false prophet to milk people out of their money worshipping a false God is what this is. Rayel is the angel of Chaos. I believe in God the father. Not saying that he didn’t have a son but his son was without sin why does this one have a rap sheet of con jobs as long as my arm? And all tithes to them should be in bitcoin? Ya right!